1. Heat the oil in a heavy frying pan over a medium heat. Add the leek or onion. and cook for 5–6 minutes, till golden and softened. Add the garlic, chopped veg, herb stalks and spices. Cook for 2-3 minutes until the garlic has softened. 2. Add the leaves in batches, stirring until wilted. Stir in the tomatoes, cover and simmer for 15 minutes. 3. Make 6 indentations into the sauce and crack the eggs into the holes. Cook gently for 5 minutes until the egg whites have almost set. Season. 4. Preheat the grill to high. Place the pan under the grill for 1–2 minutes, or till the eggs have set to your liking. 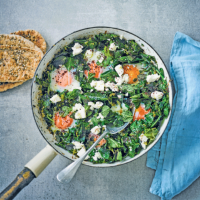 Scatter with herbs, feta and sumac or chilli flakes. Serve with bread.